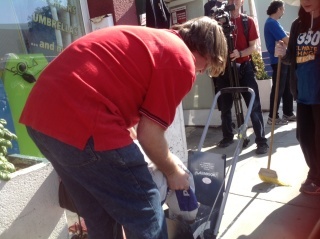 On April 21st, the First Unitarian Universalist Church of San Diego held an Earth Day event in conjunction with the Church For Our Common Home and SanDiego350. Bringing together people young and old from diverse faiths and religions, the highlight of the event was a presentation by Dr Veerabhadran Ramanthan and Dr John B. Cobb, Jr.
Dr Ramanathan and Dr Cobb spoke on solving the current ecological and climate change crises. Dr Ramanathan is a distinguished Professor of Atmospheric and Climate Sciences at Scripps Research Institute in La Jolla, who joined the Pontifical Academy in 2004 and advised Pope Francis on the encyclical Laudato Si’, subtitled “On Care For Our Common Home”. Dr Cobb is a process theologian and philosopher who has taught in Claremont School of Theology for many years and has been influential in China’s growing movement towards “ecological civilization”. Dr Ramanathan addressed the congregation first. He has studied climate change since the 1970s. Caused by the amount of carbon dioxide in the atmosphere, he says, “Nine hundred and fifty billion tons of carbon dioxide now blankets the earth.” He had predicted global warming impacts by the year 2000 and in 13 years predicts more dangerous droughts, fires, and mudslides if we do not curtail our carbon emissions. While the ramifications of climate change are dire, Dr Ramanathan proposed four solutions to help solve the crisis: 1) In ten to fifteen years, a total conversion to electricity generated from renewables – such as geothermal, hydro, solar, and wind 2) Get rid of super-pollutants such as diesel and methane by, for instance, converting all motor lawnmowers to electric lawnmowers 3) Plant more gardens 4) Have a biodigester in every restaurant and grocery store to produce biofuel and which would lessen emissions of landfill gases. Locally, he proposed the formation of a coalition – a San Diego alliance of churches, doctors and nurses, various industries and scientists to fight climate change. In working with Pope Francis in 2014, Dr Ramanathan saw the church becoming a force in climate change resolution. He noted that doctors and healthcare workers were needed in the alliance due to the virus-borne diseases released from the polar ice caps with climbing temperatures. Dr Cobb spoke on the topic of religion, spirituality, and being stewards of the earth in his segment on stage. At 93 years old, he is on a mission to bring sustainability and ecological awareness onto the world stage to counteract living in our present “unsustainable world.” Dr Cobb wants to lift up spirituality and sustainability in industrialized and Westernized society and discredits the notion that nature is something to draw from until the raw resources run out. He proposed a California Collaborative for Climate Solutions with top scientists coming together with churches and other folks on a grassroots level – to effect change to address the climate crisis. Dr Cobb sees climate change as a moral issue that should not be politicized between the Democrat and Republican parties. He praised Pope Francis’ encyclical, Laudato Si as a document that bridges and intersects many sectors of society for the common good and for the health of the planet. 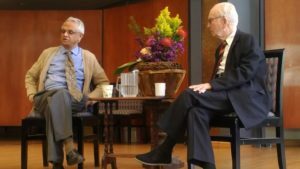 Together on stage, Dr Ramanathan and Dr Cobb then held a discourse on climate change. This ended with Dr Cobb being welcomed to come to the University of California, San Diego to speak to Dr Ramanathan’s colleagues about what actions they can take and changes they can make on climate change – in their positions as scientists. As a member of San Diego’s 350.org, I’d followed the story of the Dakota Access Pipeline (DAPL) for some time, telepathically urging the protesters on. And then one day, my friend Paul Sasso called me. “Hey, let’s go up and join the protesters. We’ll take my Tesla.” Yeah, I replied. I could do that; the next week wasn’t too busy, or the week after that. When are you thinking? I asked. “I’ll pick you up in a couple hours,” he said. Whoa, I thought for a moment; but I hurriedly packed, and soon we were off to the North Country. On the way we talked about this 30 inch diameter pipeline, the rivers (Big Sioux, Missouri, and Mississippi) and the tribal lands it would cross. Eminent Domain, one of us said, shaking our head. Did it translate in Native American languages to “broken treaty”? Another topic of discussion: major spills are common for oil and gas pipelines—a question of when, not if. As Bill McKibben explained in a New Yorker editorial, the pipeline was originally supposed to cross the Missouri River near Bismarck but those plans changed over concerns that an oil spill at that location would have wrecked the state capital’s drinking water. So the pipeline was shifted to a crossing half a mile from the Standing Rock Sioux tribe’s treaty lands. Nice. Just how angry were these protesters going to be? It seemed only reasonable that some of that anger might flare in my light-complexioned direction. I took a deep breath as I watched the prairie fly by. We arrived on September 9th, the Friday after Labor Day, and rolled into the main camp, called Oceti Sakowin, (Och-et-ee shak-oh-win), meaning Seven Council Fires. As we strolled around the camp and met all kinds of people from all over the country, and all happy to chat, the little knots of anxiety in my stomach uncoiled. A fellow there from Florida with his family not only lent us a tarp but helped Paul and I set it up with the tent we borrowed. Everyone was warm, friendly, and thanked us for our visit. They want as many people as possible to come and help carry the message of protecting the water; not just for those of us alive now but for our children and grandchildren too. That’s why they called themselves protectors, not protesters. Fitting, I thought. Accurate. Here in San Diego, we have not only a lot of sunshine for solar energy, but also an exceptional potential for geothermal energy based on the heat that flows up from deep inside the earth. Last spring, SD350’s Peg Mitchell was given a tour of the John Featherstone Facility, a geothermal energy plant located within the Salton Sea Known Geothermal Resource Area in the Imperial Valley. Peg has written about what she learned for SD350’s October column in the San Diego Free Press. In case you’d like to learn a little more, we’ve shown below a few presentation slides provided by a company developing this renewable energy resource in our region. This post and my last one are about a journey that has changed my view of myself as a climate activist. That journey took me to two climate conferences in a month. I found new friends, a new awareness of how active the climate movement has become, and a lot of ideas about the issues that call for action and how I can respond to them. Last time, I wrote about the first part of that journey, the Pando Populus conference in Claremont, California. Now I want to share the second part with you. I joined 5000 other Unitarian Universalists at our annual Assembly. Climate justice is a moral commitment for UUs. 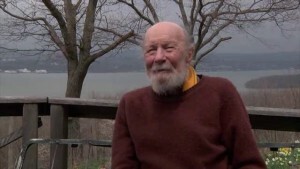 Folk singer Pete Seeger, age 94, at his home on the Hudson River, where he was interviewed for Pando Populus. I started my journey singing with Pete Seeger and ended it three weeks later with the fiery intellectual Cornel West! I just got back from Pando Populus in Claremont, California, and the Unitarian Universalist General Assembly in Portland, Oregon. After 25 to 30 lectures — together with great music, stimulating presenters and a lot of new friends — I’m ready to get down to the business of local organizing for climate action. But first, I’d like to share my notes about these inspiring conferences. I’ll tell you about Pando Populus this time, and the UU Assembly in a second posting. “Seizing an alternative” logo from the Pando Populuus conference. La Mesa residents in the audience of the Planning Commision hearing hold signs provided by SD350 to show support for a strong Climate Action Plan. 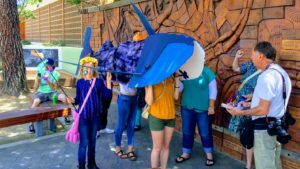 On Wednesday, June 3, concerned citizens came together at a hearing of the La Mesa Planning Commission to press for a stronger Climate Action Plan (CAP). Many of those who came to speak were volunteers with SD350. The hearing turned out to be an uplifting reminder of what regular folks working together can achieve. 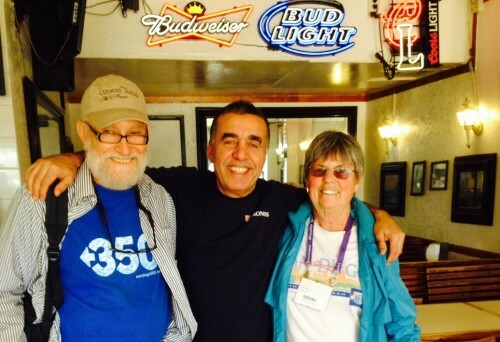 In early observance of Earth Day, dozens of SD350 volunteers, high on solar power and down on fracking, showed up Sunday, April 19th to work at Earth Fair 2015. (Officially Earth Day is April 22nd.) 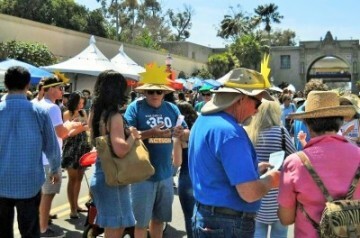 60,000 fair-goers crowded into the park, many of them crossing Cabrillo Bridge and walking along El Prado where they came upon SD350’s Sustainability and Anti-Fracking booths. What a great spot for visibility! — right there on Balboa Park’s only western access route. Volunteers Keith Fowler, Bob Braaton, and Bruce Graves are kept busy answering questions and soliciting petition signatures. Hungry? Step Inside Earth Fair’s Garden of Eating! Many of us take pains to do the right thing for the environment. We may recycle, take shorter showers, and turn the lights off when leaving a room. But did you know that you can eat your way into making an even bigger difference? It’s true: food choices matter in so many ways. The great news is this is an area where personal health and happiness come together with conserving resources, building community, and addressing climate change – not to mention more compassion for the animals we share this planet with. 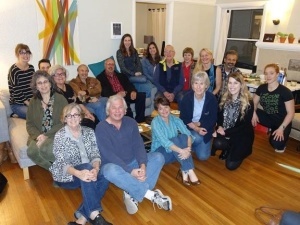 A recent SanDiego350 Planet-Based Diet Team book discussion of Comfortably Unaware. Click photo for the event presentation Powerpoint! 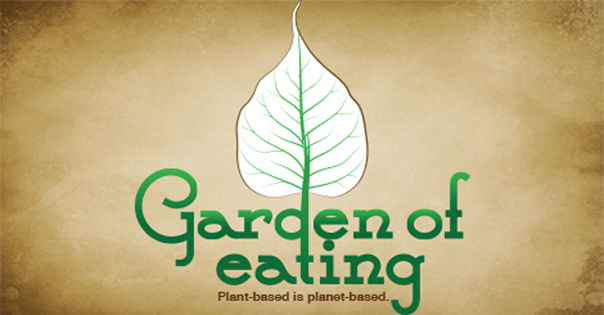 At this year’s Earth Fair on Sunday, April 19 from 10am – 5pm in Balboa Park, SanDiego350’s “Planet-Based Diet” team invites you into the Garden of Eating, where you can experience the pleasures of good food, good life, and good earth – and we promise, it’s anything but rabbit food! How can this be? In a nutshell, we are now rearing 70 billion livestock animals for slaughter annually on a planet of 7 billion people, with both numbers growing each year. Yet our resources are finite, and it takes quite a bit of them – and causes shocking amounts of environmental damage – to accommodate these animals before they end up on our plates. Take, for example, freshwater depletion. Per Pacific Institute, the crop receiving most of drought-stricken California’s water is alfalfa hay (livestock feed) and a whopping 47% of California’s total water footprint is associated with meat and dairy. Yet: “Eating lower on the food chain could allow the same volume of water to feed two Americans instead of one, with no loss in overall nutrition” (Scientific American, “Growing More Food With Less Water”). 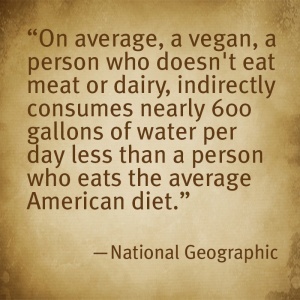 While Shorter showers save about 2.5 gallons, National Geographic says the average vegan diet saves 600 gallons of water per day! With California’s water supply running out, there’s no single more effective way to help save it. Other areas of resource depletion in which animal agriculture is being called a leading cause are deforestation, water pollution, rainforest destruction, species extinction, habitat loss, topsoil erosion, and ocean dead zones. 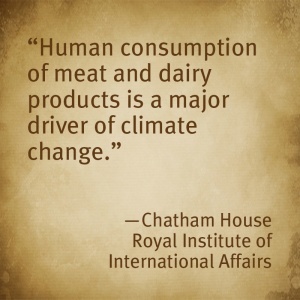 The documentary “Cowspiracy” explains this in further detail (check out their extensive fact sheet). 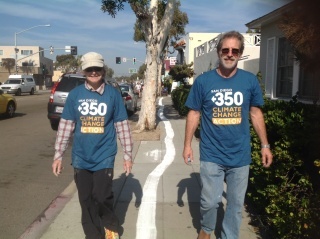 And then there’s the creation of greenhouse gases and climate change, which is the focus of SanDiego350. 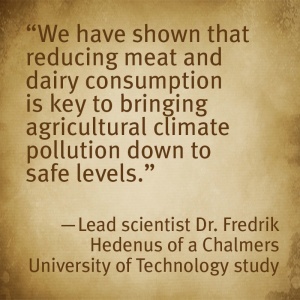 Although energy and transportation are major contributors, animal agriculture is responsible for 35% of methane and 65% of nitrous oxide emissions, which trap much more heat than carbon dioxide (UN FAO). In fact, animal agriculture is reportedly responsible for more emissions than all forms of transportation combined (UN FAO), with one more recent study finding it is responsible for 51% of total emissions (Worldwatch Institute)! Deutsche Bank Research says, “Greenhouse gas emissions from meat-eating warrant the same scrutiny as do those from driving and flying.” And Rajendra Pachauri, the head of the UN IPCC, begs us, “Please eat less meat—meat is a very carbon-intensive commodity.” He adds that doing so is the most immediate and feasible way to reduce emissions in a short period of time. Although fish are often considered a more environmentally friendly option, our population’s demand for seafood is simply greater than the oceans are capable of producing. Outrageously, one third of all fish removed from the ocean, with most discarded as “bycatch,” are fed to livestock. Scientists say the oceans will be completely depleted at this rate by 2048. Additionally, removing too many fish from the ocean sets off a chain of events that further warms the atmosphere. Due to this rapid depletion of wild sea life, about half of the world’s fish currently come from fish farms, which are incredibly environmentally destructive and often poorly regulated. But Grass-Fed Beef and Cage-Free Eggs Are Fine, Right? Those opposed to factory farming may be reassured by meat labeled grass-fed, cage-free, local, organic, or sustainable. But what do these words really mean in this sense? Although impacts may be less in some areas, producing animal versus plant foods still uses far more resources and creates more greenhouses gases under any circumstances. Far more plants can be produced on a given acre of land, and using fewer resources, than animal foods. And ultimately, creating demand for meat products is what necessitates factory farming in the first place due to scarcity of land. Finally, consider the fact that one-third of all arable land on earth is used to grow livestock feed while millions of human beings starve to death each year – yet the World Hunger Program at Brown University found that a plant-based diet can feed billions more people. This seems like reason enough to give veg eating a try, no? 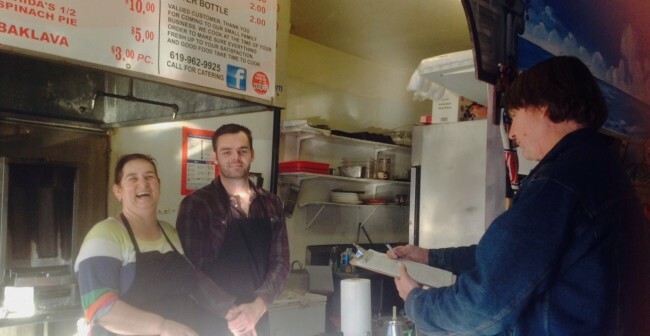 Death and Taxes… and Meat? With all this destruction being caused by animal agriculture and fishing, why are meat and animal products still so prevalent? Apart from current preferences and habits, it’s a clear case of profit over planet. Gigantic tax subsidies ($38 billion for meat and dairy vs. only $17 million for fruits and veggies, per Meatonomics) keep the price of meat products artificially cheap compared to the amount of irreplaceable natural resources used to produce them, and the true environmental cost is deferred to future generations ­– and possibly ourselves. Is a plant-based diet healthy? Most definitely! It is the American Dietetic Association’s position that vegetarian and vegan diets are “healthful, nutritionally adequate, and may provide health benefits in the prevention and treatment of certain diseases” and “are appropriate for individuals during all stages of the life cycle.” If our closest relative, the gorilla, can thrive as an herbivore, so can we! Luckily, plant-based eating is a trend that’s here to stay. Vegan alternatives are getting better and better, and are now available in most grocery stores. At the Garden of Eating, plenty of samples, demos, speakers, performers, factoids, and other features await you once you step inside, including nationally recognized environmental activist Rob Greenfield’s “Food Waste Fiasco.” Jimbo’s, San Diego Soy Dairy, and Be Wise Ranch have generously donated food and supplies for our food demonstration stage. Vegetarians and omnivores alike are welcome! No “vegan police” will be present. The hope is simply for you to come away inspired and excited about plant-based eating. The Garden of Eating will be located adjacent to the Timken Museum. Get more event info and RSVP here! Bring your appetite, and we’ll see you there! Graphics by Amy Duncan/Wonder Creative. Martin Luther King Day was a gorgeous winter day in San Diego, perfect for visually demonstrating the effect of climate change on one of our favorite communities, Mission Beach. Sea-level rise is already starting to affect this popular beach community, and by 2050 high tides will be reaching across Mission Boulevard. 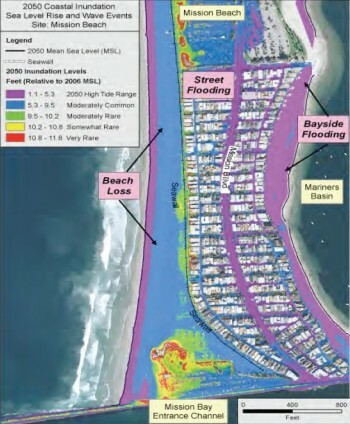 By the end of the century, if public policy towards climate change doesn’t recognize the threat of sea-level rise, Mission Beach will be mostly under water. The purpose of demonstrating this threat was to create public support for a stronger Climate Action Plan (CAP) for San Diego in an effort to mitigate the disastrous effects of climate change. 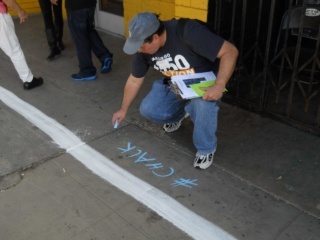 With the aid of a map showing where the High Water Line (HWL) is likely to be by 2050, the Crowd Engagement Team (CET) planned a “public art installation” event, using a mechanical chalker to create a visual representation of the HWL along the east-side sidewalk of Mission Boulevard. The original idea for this event comes from Eve Mosher of Brooklyn, NY. Find out about events like ours that Eve has inspired at http://www.HighWaterLine.org. 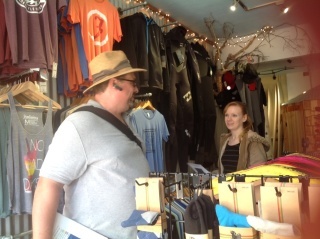 In the two weeks preceding our event, members of the CET and the Media Team canvassed community businesses to tell them about SD350’s plan to stage this event. Because Mission Beach has already experienced some effects of sea-level rise, notably at high tides during storms, we found that most business owners and residents see the need for stronger public policy to mitigate climate change. 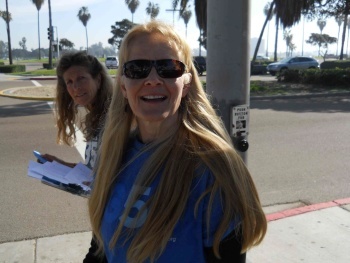 Canvassers were able to gather fifty-three signatures from business owners, employees and residents to urge the San Diego City Council to adopt a stronger Climate Action Plan. Ray Paulson gets a signature (and a free sample!) from the owners of Arslan’s and Vashida’s Restaurant. Some of us returned to eat a late lunch there after the HWL event. Jeanne and Ellen are all smiles: Time to get started. 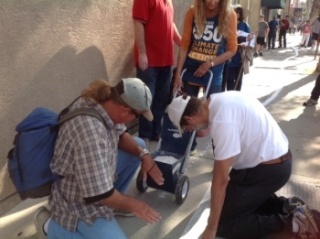 On the actual day of the HWL chalking, SD350 volunteers gathered at the north-east corner of Mission Boulevard and Mission Bay Drive. The eagerness on the faces of CET-leader Jeanne Peterson and record-keeper Ellen Speert (with the clipboard) indicate they’re ready for the day’s action. KPBS cameraman films Dwane Brown interviewing Mission Boulevard business owner Jason Daung. So, how does one go about generating so much interest and media coverage for chalking a high-water line? 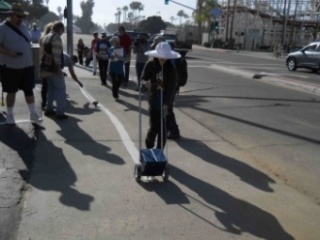 You can come along with us as we walk north on Mission Boulevard, chatting with news folks, tourists, residents and business owners along the way..
Leaving behind Belmont Park’s historic roller coaster, the line starts north on Mission Blvd. 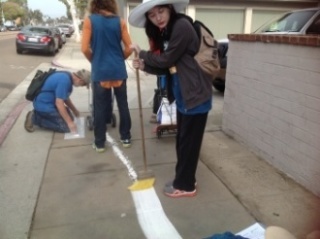 Ellen runs the chalker while Rachel Eggers spreads and sets the chalk line with a broom. 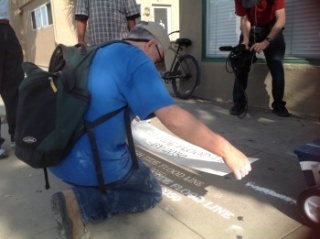 Check out the cool shadow Michael makes when he carefully lifts the stencil. 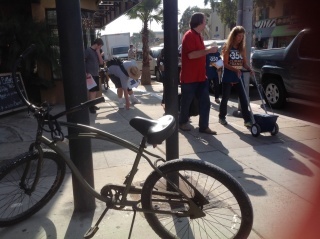 3rd-generation Mission Beach resident Robby Shea joins Bill Avrin, giving Michael a break from stenciling. James Long chalks a hashtag along the HWL. 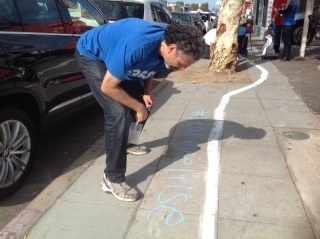 Dave Engel inspects his sea-level-rise message. The chalker must be re-filled. Ray volunteers. Ellen engages a curious citizen in conversation about the effects of climate change on sea-level. Susan Crowe and Michael Zimmer walk the line. 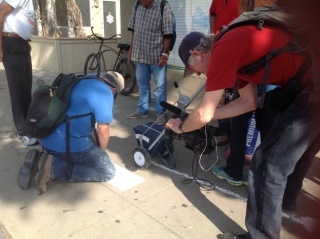 Closing in for a detailed shot, Ralph Chaney gets Michael setting a stenciling on film. Chalkers pass iconic, zero-emissions beach cruiser. 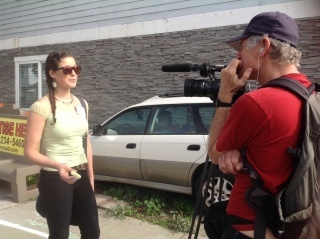 Ashley Mazanec explains the action while Ralph films for SD350’s website. 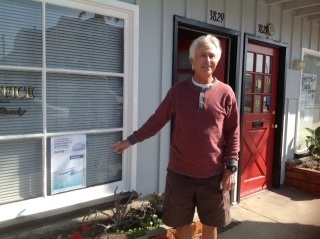 One of many proprietors who gladly displayed our HWL poster in their windows is attorney John Ready. 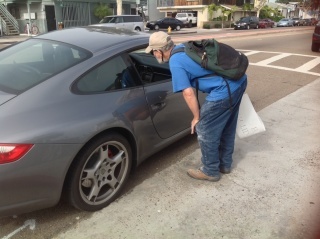 Michael chats up a Porsche driver who stopped to see what was going on. 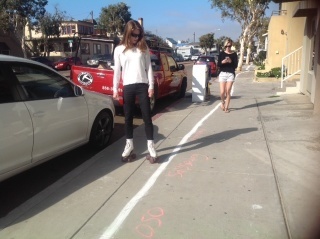 Like many passers-by, this sidewalk skater checks out sea-level-rise messages along the HWL. … and the line continues. 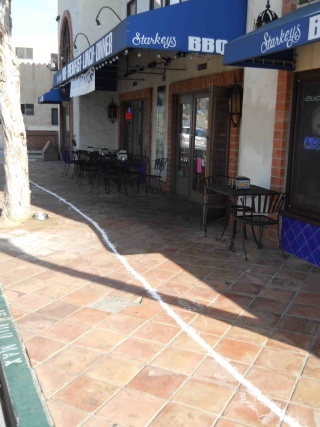 The bright white line that started at the corner of Mission Bay Drive and Mission Boulevard went north as far as Pacific Beach Boulevard, a distance of just over a mile. Along the way, SD350 members had many opportunities to converse with people passing by. Vacationers and residents alike were aware of climate change, but many learned something they hadn’t known about one of its damaging effects: sea-level rise, right here in Mission Beach. That, plus the great media coverage, the good time we all had, and the companionship we enjoyed made the HWL action the success we all hoped it would be. Many thanks to Bill Avrin for his pictures of the HWL event. It must also be said that Angela Deegan and Ashley Mazanec of the Media Team were largely responsible for the outstanding media coverage. Twenty-one seniors from King-Chavez Charter High School’s Environmental Justice class made the long trek to Kern County in California’s Central Valley to view the effects of the oil industry, and fracking in particular, on the land and the residents of the region. Friday, December 19th, was the last day of the term for students at the King-Chavez Charter High School in San Diego. Twenty-one seniors from the Environmental Justice class trekked in the dark to board a school bus at 6AM for a long trip to the oil fields of Kern County. They had signed on to witness for themselves the impact of of the oil and gas industry, and fracking in particular, on the communities nearby. KIng-Chavez High School students gather after their five-hour bus trip from San Diego to Kern County. Tom Frantz from Association of Irritated Residents (Great name!) began the tour at the “Panorama Overlook”, breathtaking for its view of oil pump jacks in every direction as far as the eye can see. Among the rigs students could spot an occasional power plant, used for heating up water into steam to use in the “cyclic steam injection” process – an older method for releasing the tarry oil to flow up the wellhead an out to the pipelines. 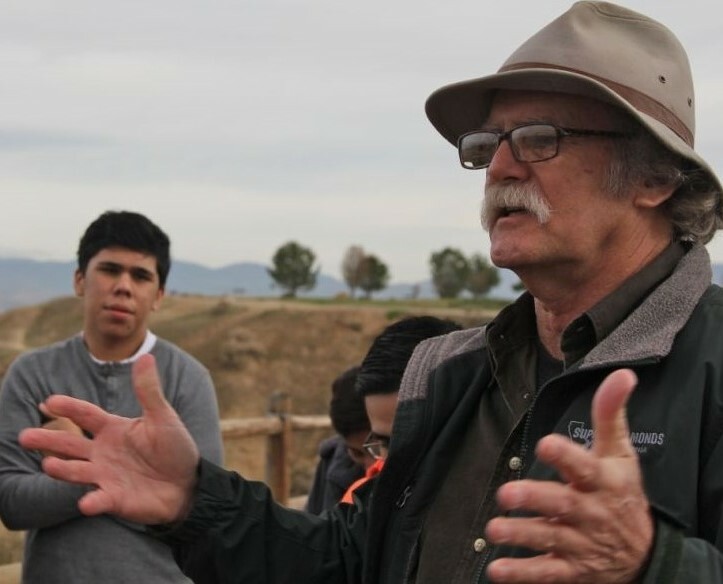 Tom Frantz’s stories about the problems created by fracking hold the students’ attention. A retired high school Math teacher, Tom doesn’t accept this status quo. He spends his time traveling around the Kern County oil fields checking up on activities of the oil production industry. He has caught drillers illegally dumping highly polluted toxic “produced water” from fracking operations into fields; he has teamed with other organizations from Texas using special cameras to film methane and other pollutants as they leak from pump sites and compressor stations; and he has discovered leakage and resulting air pollution from open evaporation pits that contain all the waste from oil and gas operations. 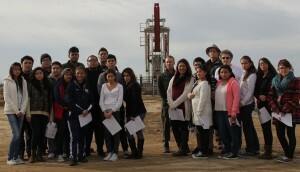 Continuing on their bus tour, students witnessed oil rigs placed amidst agricultural fields and one right next to an elementary school, near the town of Shafter. Next to the school, a gardener turned over soil in the community garden situated in the rig’s shadow. Children at the school suffer from numerous health problems, particularly asthma and respiratory issues. The last stop on the tour was a history lesson: the Belridge Oil fields and the towns of McKittrick and Taft are best known as being the location as well as subject matter of the movie “There Will Be Blood” – a movie about the beginnings of the oil industry in California and the cutthroat dealings that went on to secure land and drilling rights. Because of what they witnessed, these 21 seniors from King-Chavez High School now have strong, disturbing images of the impact that industrialization of the valley has had on the nearby communities, the school children, and even the food they themselves eat. They also have a clear sense of what “environmental justice” means and are, therefore, determined to stay engaged in this issue and help SanDiego350 in future efforts to inform the public.